This lamp is just what I was looking for. I placed it on a cabinet next to my couch which I thinks works well. My cabinet is mirrored and silver. The quality of the lamp and shade are well worth the price. 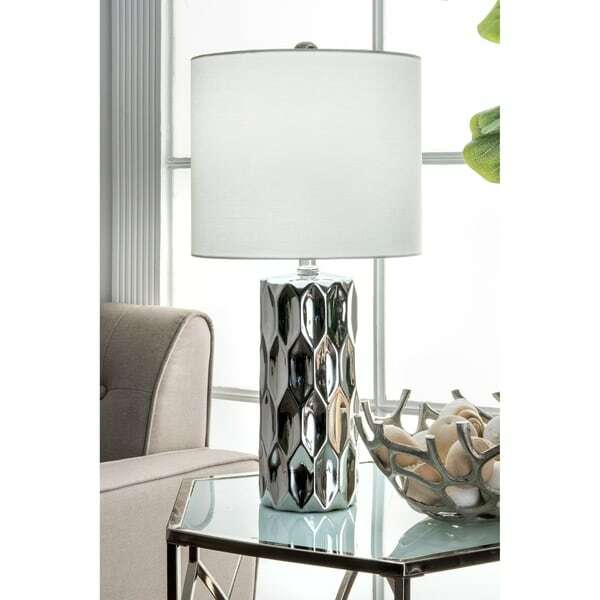 Safavieh Lighting 21-inch Rorie Table Lamp - Silver - 10" x 10" x 21"
Let your room shine with the addition of this lavish 22-inch abstract table lamp. It has a Cotton Drum shade that delivers bright ambient lighting. Adds a vibrant flair to any room with its silver ceramic finish. It has a 11-inch wide, ivory cotton, drum lampshade that delivers soft lighting. Dimensions 19.0 In. X 12.0 In. X 19.0 In.